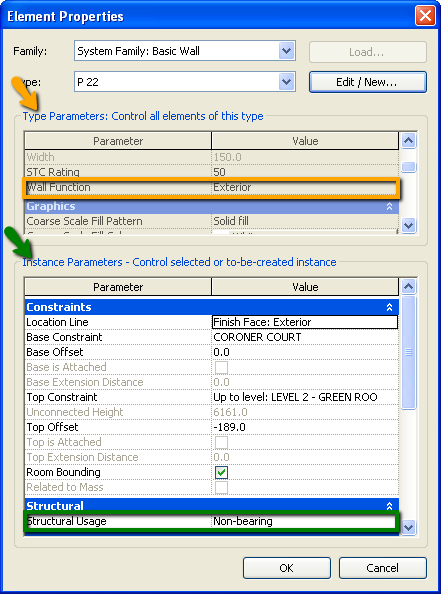 In Revit 2009, the property panel of a wall looks something like shown below. The Instance parameter "Structural Usage" (in green) is available in wall schedules, and also it is very important in determining the visibility of the element in function of the instance View parameter "Discipline". This means that if you set your view discipline to "structural" only structural elements will be shown, and walls whose "Structural Usage" is NOT set to "Non-bearing". The type parameter "Wall Function", on the other hand (in orange), is NOT available in wall schedules (nor view filters), and therefore the meaning of its existence becomes much more obscure to me.